The Tollycraft 30' Sport Cruiser is well known as a "big" small boat. and has been entirely re-done as has the exterior to a large extent. 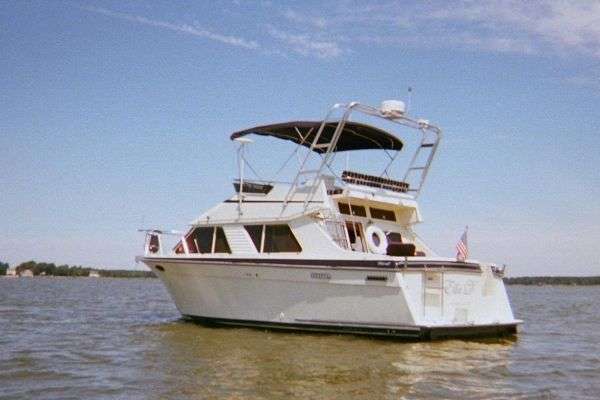 We invite you to compare her to any other Tollycraft 30' Sport Cruiser on or off the market; she is quite simply the best! Again, we cannot emphasize how exceptional the condition of this boat is. and that is most certainly the case with this Tollycraft 30! Borg Warner 1:1 V drives. Fuel Capacity : 197 gal. Accommodates up to five in a beautifully maintained interior. There is an abundance of natural light and ventilation with windows surrounding the salon and galley area, several of which are sliders with screens as well as two fixed ports in the forward cabin and a large hatch all of the windows, screens and blinds/curtains were new in 2009. There is ample artificial light with several dome style overhead lamps located throughout as well as reading lamps at the berth. A 12K btu reverse cycle (heats & cools) air conditioning unit (new in 2004) provides heat for season extending use or cooling during warmer summer months. There is generous varnished teak joiner work and a varnished teak and holly sole new in 2009. 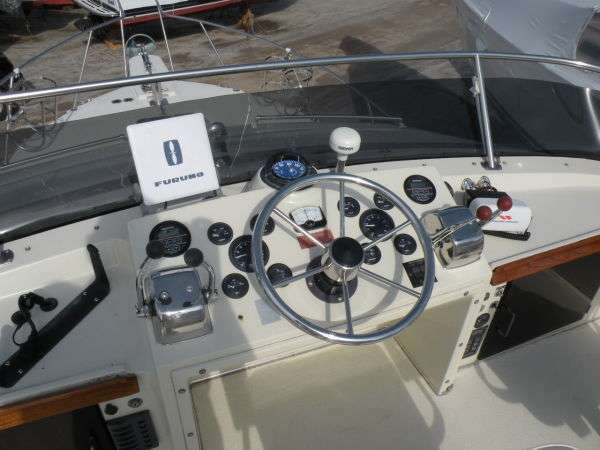 All of the interior wood finish was refinished in 2009 at which time the custom teak "ceilings" were added to the V-berth area replacing the standard vinyl hull liner and the entire head liner was replaced at that time as well. The interior of this well thought out 30' is unlike anything you have seen given her "command bridge" configuration. There are plenty of boats 35-36' that simply do not provide the generous interior that the Tollycraft 30 does. Starting from aft upon entering through the slider from the cockpit one finds the L-shaped galley to starboard featuring new counter tops, stainless sink and faucet '08. Cooking is done from an electric 3 burner stove with convection microwave while refrigerated and frozen food items are easily handled by the dual voltage Domestic refrigerator/freezer installed new in 2008. There is ample storage in several lockers and drawers. Opposite the galley the enclosed head featuring a generous cultured marble vanity with molded in sink and H&C pressure water, excellent storage in lockers and a drawer and a Sealand Vacuflush W.C. new in '05. 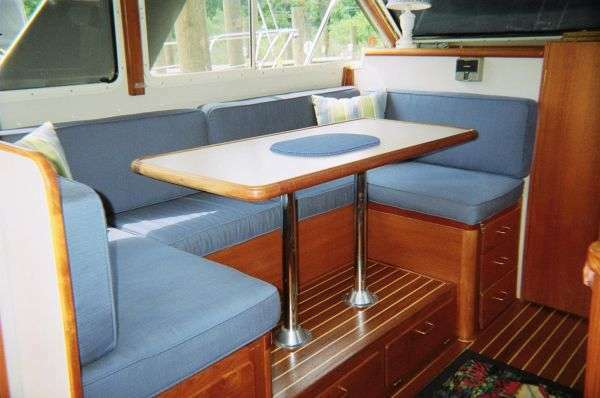 Next forward is the full width Salon featuring a U-shaped dinette to port below which there is bin type storage under the outboard portion of the settee and seven drawers fitted at the inboard section. Dining is off of a large pedestal mounted table that may be lowered to settee height forming a generous double berth. Opposite to starboard is a full length straight settee with some storage below and a locker forward. There is also storage outboard of the back rest. On centerline is the companionway to the private forward stateroom featuring a 6'8" V-berth with filler. An abundance of storage is provided in the stateroom with drawers underneath on centerline and two lockers in the extended portion of the "V" with two hanging lockers aft P&S. Above the berth there are teak hull ceilings and full length storage shelves. A door at the fwd bulkhead accesses the anchor locker. The yacht's electrical distribution panels are located above the hanging lockers at the aft portion of the cabin. Throughout, the interior of this Tollycraft 30 is in remarkable condition and shows literally like new. Weems & Platch Brass weather station & clock. New Custom Craft Mattress 2010. Electrical Wired for 12 Volt DC and 110 Volt AC service. A Koehler generator new in 2004 handles all AC service requirements when off the dock. 12 Volt DC .Switch panel with breakers. Two (2) 90 amp alternators. All electronics are located at the helm station on the command bridge. There is a separate Blue Seas Navigation Instrument breaker panel in 2008. The cockpit is expansive and is full width with large hatches accessing the machinery space and adjoining storage compartment in the house. Steps up to the side decks leading forward to the side decks and a short stainless steel ladder with teak treads accesses the bridge. Transom, door accesses the fiberglass swim platform. New custom aluminum radar arch in 2009 along with exterior cushions and canvas and new Todd helmsman and companion seat in 2008.